Although only recommended for testing purposes, having Nested Virtualization in your VMware vSphere Lab is really something worth trying out!! I already have a Lab with VMware vSphere 5.1 installed and configured, so I'll straight away get to the steps of it. VMware ESXi 5.1 installed server preferably with either Intel-VT or AMD-V support on the CPUs. CPU supporting Intel EPT or AMD RVI If you only meet the first criteria, you CAN still install nested VMs or other hypervisors on ESXi 5.1, BUT you will only be able to run 32-bit nested virtual machines. RECOMMENDATION: For good performance of your nested virtualized VM, make sure you supply it with adequate RAM and vCPU. DISCLAIMER: This is not officially supported by VMware, please use at your own risk and DO NOT try this in a production environment. 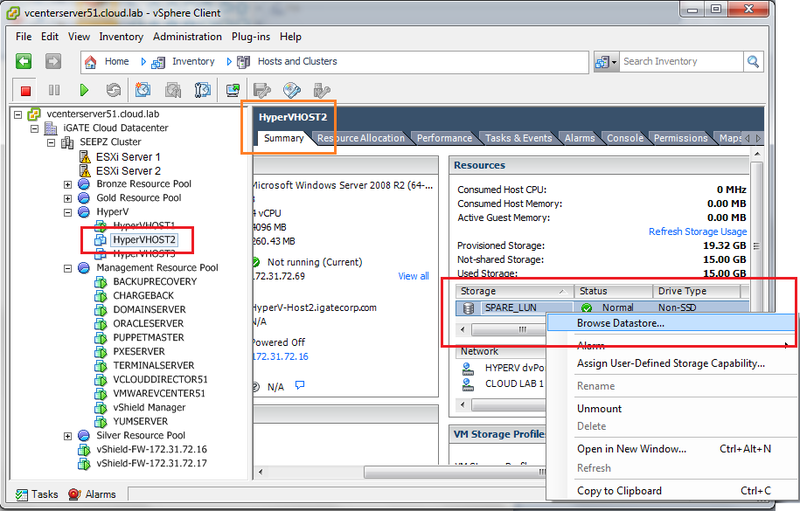 Select your VM and browse to its Datastore. Select the xxxxxxx.vmx file. The VMX file is the VM's configuration file. Browse the location where you want to save the VMX file locally. You will get a Warning message as shown. Click Yes to continue. 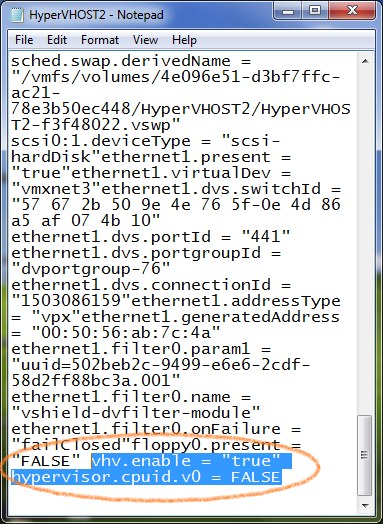 Open the saved VMX file using Notepad. You will see a lot of configuration elements present in the file. Simply add the following two lines of code at the end of the file. DO NOT make any other changes in the file UNLESS you know what you are doing. You may get a warning message that a file with the same name already exists. Simply agree to it and continue. 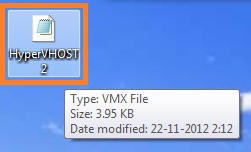 DO NOT change the VMX file name under any circumstances. NOTE: The VMX file icon may appear as an "unknow file" or you may have issues when you try to power on the VM after you made changes to it. 1. The VMX file needs to be encoded in UTF 8. Sometimes when we save the VMX file using notepad/ wordpad, this encoding gets changed. You can correct it by opening the VMX file in Notepad and saving the file again with UTF 8 encoding. 2. You may have invalid characters in your VMX file. I would recommend that you type out the two additional lines in the VMX file rather than copy/ pasting them as the character formats can vary from system to system. This can cause your VMX to display an error message saying "unknown characters"